We were scheduled to take a cruise in February. Unfortunately we were delayed due to severe weather in Seattle. We were routed to 2 different airlines to try to get us to LA. Finally were were put on a plane, but didn't arrive until 3:19 pm. The doors to the ship closed at 3 pm. I contacted Allianz on 2.25.19 and provided the documents they requested. I have yet to have any resolution on my claim. They keep asking for additional documents, I have sent them everything I have. Related: Asap Tickets - ASAP Travel and ITN insurance ripped me off. The last documents were sent 3.19.19.....nothing! If my employer handled their customer base as they do, I wouldn't have a job! Review #1503256 is a subjective opinion of poster. Review #1447658 is a subjective opinion of poster. I use them for the last couple years for business and also personal and always buy the travel insurance from them and never had a problem with my flights but this last time I got a ticket from them for my in laws everything was OK coming in but in the way back they keep changing the date of the departures back and forth and the day my father in law hurt himself and miss his flight they didn't want me to use my insurance I got from them and they dont even return my phone calls. I have a note from the Dr saying that he's not allowed to travel for a few days. We did everything from the book. I call and cancel the flight before taking off and still they dont want to pay for my ticket. So if you want to buy ticket from there site because you want to save few dollars think two times before you get it from them. I can assure you that the insurance they sale you is a hock. Thank you for your review. We are sorry to hear about your unfortunate experience and regret that you were not satisfied with the service. We would like to investigate the details of your case to see what errors have been made. Could you please provide your booking details and full name/email address you gave our agent by sending them to feedback@asaptickets.com. Review #1399774 is a subjective opinion of poster. I bought insurance that the rep said would cover irrespective of the reason for cancellation. Hello, It is difficult to respond to your complaint without the ability to view your reservation. It may be the case that the agent was referring to our cancel for any reason supplement. That said, if you have more questions, please don't hesitate to contact our office via our online forms. Review #1342691 is a subjective opinion of poster. Asap Tickets - ASAP Travel and ITN insurance ripped me off. 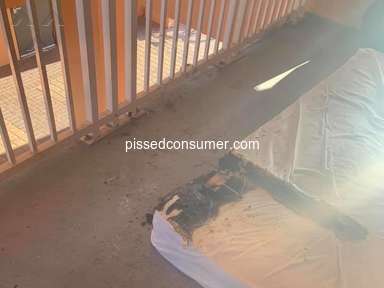 July 214, 2018 TO: https://www.pissedconsumer.com Thank you Michael, I can not find the words to show appreciation for you taking the sincere interest in my complaint with a sincere interest in seeking a solution by requesting that I agree to Prepare a video outlining the facts which I will do for the benefit of all victims of ASAP, ITN and others who have been cheated by travel agents as it has taken me 6 months with several medical documents and doctors letters Which both ASAP and ITN refused to acknowledge receipt of, then claimed they could not open JPEGS of doctors letters and then asked me to fax which I did but to no avail so I snail-mailed the material an still to no avail. Exposing the trickery of ASAP and ITN to cheat good faith clients like me (and others) into exposing these people who behaved like common street thieves which is so bad for their business And for all travel service agents worldwide who incidentally are doing nothing to help clean up the horrible business ethics existing worldwide. 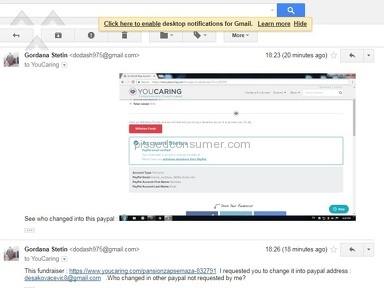 I am more than happy to respond to anyone who will email me at zvpc.zvpc@gmail.com My wife is practically on her deathbed after being given 3 to 6 month to live wherein she has an autoimmune disease which is incurable and which creates its own cancers (various types). The disease attacks every organ in the body. She has had her lungs, kidney, liver, immune system, Colin attacked and she is now wearing a Colostomy bag but her “Wegener's Disease” I is impossible to treat if there is stress in patients own life. No one individual, firm, company, agent or any evil force that has created more stress on my wife and I than ASAP and their " insurance" company (ITN) I have also contacted TICO.CA (The Canadian Industry Council of Ontario) which showed little or no interest in seeking a solution or even to intervene in the fact that ASAP has had my money since August 31, 2017 which They have returned some of my money because I shamed them into doing so through my postings on Internet ad my report to the San Francisco Police who also ignored my complaint and refused to even respond. Should I, therefore, assume that ASAP and ITN are “well connected”? Once again a very sincere "THANK YOU” Michael TO YOUR FIRM. 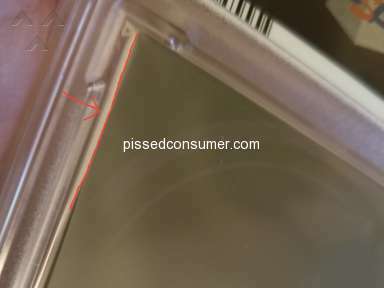 https://www.pissedconsumer.com for doing more than all other parties combined. I encourage every person who has ever been cheated by any travel agency to contact your online firm because Cheated pissed off victims are part of the problem IF THEY REMAIN SILENT. 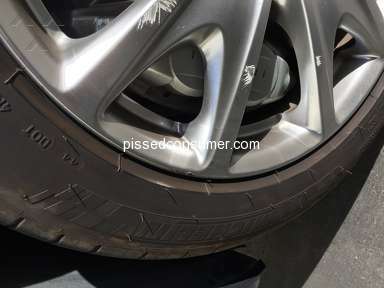 Without the help from your firm I would still be spinning my wheels but thanks to you that although they still owe me money you did succeed in shaming them into returning over $3000 so far, I will not give up until they reimburse me every penny they owe me. 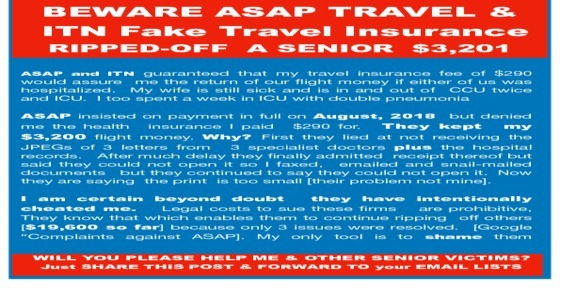 ASAP an ITN guaranteed me that my travel insurance fee of $290 would guarantee the return of our flight money if we were hospitalized. Prior to flight time I was hospitalized in CCU with double pneumonia. Also my spouse was in CCU twice and a week in ICU. 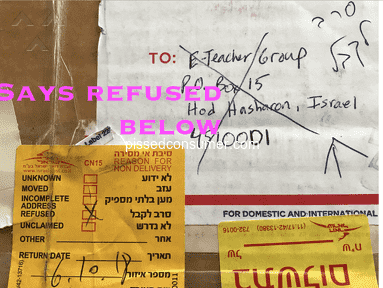 They refused to refund my $3,200 flight money. First they claimed the did not receive the JPEGs of three Specialist doctors. After much delay they finally admitted receipt thereof but said they could not open it so I faxed the 3 letters, emailed the 3 letters and snail mailed the 3 letters but continue to say they could not open it. then said they could not read it. So they succeeded in ripping me off. My only tools are to sue them which lawyer fees would prohibit and they know that and they benefit from that. OR I can try shaming them with this complaint letter which I will try to warn others by pasting on the many social media networks and finally prepare and post to Twitter, Facebook and other outlets digitally to warn others that they too could get ripped off like I did. Thanks! I ALMOST booked with them! Thank you for bringing this situation to our attention. We do apologize greatly for the inconvenience encountered. Review #1254270 is a subjective opinion of poster. More of a scam than insurance. Catch 22 through out the contract, no real coverage! I'm very sorry to hear of your dissatisfaction over the insurance. If you'd like to share additional feedback with us, please feel free to contact our office and someone will be happy to discuss this with you. Thank you for doing business with Vacations To Go and we hope to have the opportunity to work with you in the future. Review #1248152 is a subjective opinion of poster. I purchased a ticket with a cancellation insurance. Due to documented personal challenges I cannot attend the flight. Instead of doing as other companys like Qatar Airways does immediately: returning the money and giving and excellent customer service, these cheap street salesmen deny me whats mine. Please avoid Brussels Airlines. Better pay a little extra and use companies like SAS, Norwegian, Air Asia, Qatar Airways, etc. Review #1172784 is a subjective opinion of poster. My best friend had a bad experienced just recently with asap ticket, i bought her ticket with a travel insurance, but when she move her return date to a latter date the airline company charge her $295 for ticket change + 150 for penalty a total of $445 which is too much, and when i told them she has insurance they said they dont honor it and they said to call the insurance but when we call them we can't get hold of them. Its rediculous that a travel insurance is nothing but a hoax. They just want make more money. 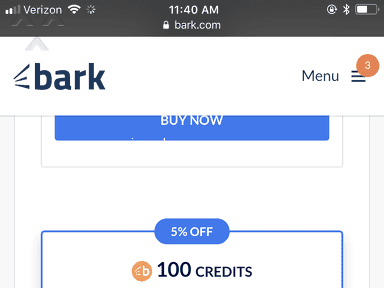 They are a ripped off company. My husband and I had ticket protection thru ASAP/ITN. I was hospitalized for emergency surgery and unable to fly for 2 months. We supplied all documents and then ASAP wanted docs translated! So I had that done. We requested refund but were told ticket was partially used so it didn’t qualify. We requested credit but they only offered 1/3 of the remaining ticket value. ASAP service person just kept making up reasons not to pay then refused to respond. We prefer contact by email or International number as we are overseas and neednewtickets to go home!! We are grateful for you taking the time to share your feedback. If you bought the travel insurance through an insurance agency you need to contact them for reimbursement. ITN Corp is not selling travel insurance. The only product that ITN offers is the Ticket Protection plan which covers only the tickets purchased and exchanged/refunded trough ITN Corp. If you have a reservation with us, kindly forward your booking details to feedback@itncorp.com and we will be glad to assist you. Review #1001753 is a subjective opinion of PissedConsumer1001753. I thought I had travel insurance but now that I was in an accident, am in a wheel chair and havnt been able to travel, I have found out that ASAP's travel insurance isnt really travel insurance. They are not refunding my ticket even though I am in a wheel chair. Even more ridiculous is that they want to charge me money to request a refund from the airline!!!! The agent that I talked to when I bought ASAP's travel insurance clearly lied to me misleading me into thinking that it would cover ANY reason if I needed to cancel the flight. If I had read all the print I would have figured it out but I didnt because I trusted the agent that I had talked to on the phone. I finally got a full refund! I think the agents there need to speak better English and in general be better organised. According to our Ticket Protection policy, you were eligible for a full refund due to hospitalization of the passenger. The amounts that were charged and deducted in order to process the refund will be refunded back you. The refund will be processed today and you will receive the charged amount from 3 up to 5 business days. Review #997911 is a subjective opinion of poster. Seem's we should have done our research. We have been receiving the ol' runaround since September 2016 for our upcoming February 2017 Iceland trip. We can not make it during the date offered and we also were sold the "Cancel at anytime" insurance. Apparently the person on the other end of the phone sold us a third party insurance from TravelEx and after fee's we were told they could gladly give us about $98 bucks back. Yay, thank you Gate 1. 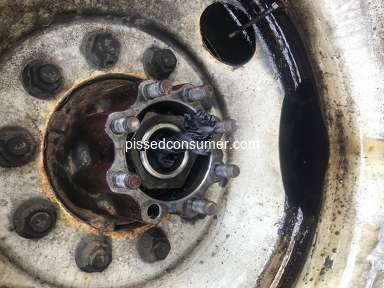 After we called the first time they told us they understood and we could expect a refund. We received an email stating we would not get a refund. We called again, same story but they apologized. This went on for 4 months. Now it's at the point were their fine print kicks in and it's leaning toward their favor. They get to keep at least 90% of what was paid. The insurance can not be refunded even though it's non-usable and Gate 1 wins again. It's a tuff lesson to learn but I suppose we have learned there will be no trip, no money and Gate 1 will keep on stealing peoples hard earned money. We certainly regret any misunderstanding about the cancellation terms or insurance purchased. We do understand that a supervisor has reached our to review the matter further. Review #984778 is a subjective opinion of PissedConsumer984778.